China's first large passenger plane rolled off the assembly line on Monday in Shanghai. China's first large passenger plane rolled off the assembly line on Monday in Shanghai. This makes aviation history in China and marks a breakthrough in the country's high-end manufacturing. The C919 plane can seat 158 to 174 passengers and has a standard range of 5,555 kilometers, designed and made in accordance with international standards. The rollout of the first C919 aircraft must be congratulated as Chinese people have long-dreamed of having such a domestic-made plane, even though making it met many challenges. 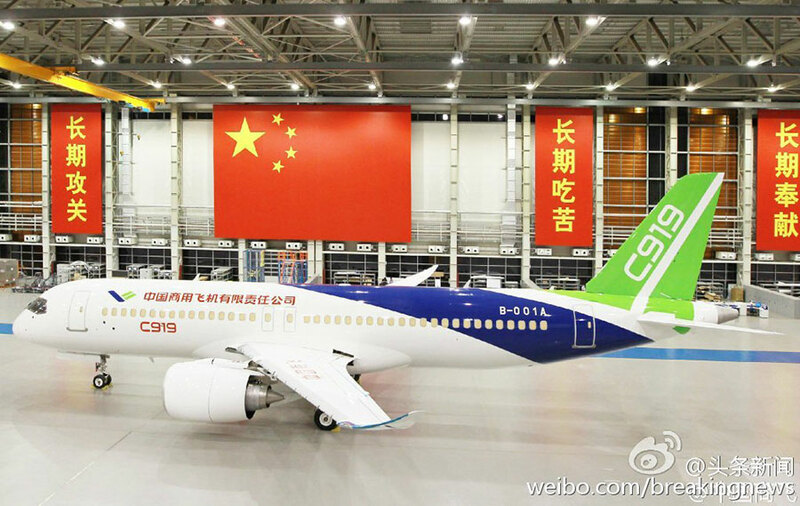 The C919 plane will have its maiden flight next year and is set to be put into use in 2018. But hopes have already flourished. Orders for 517 of the C919 plane have been made, with 21 from foreign countries. This indicates that China is beginning to join the international competition for passenger planes. Meanwhile, about 70 percent of the components for the C919 aircraft were imported, including key devices like engines, avionics, flight control and the undercarriage. Although manufacturers of large passenger planes all purchase components globally, the C919 aircraft still reflects the gap between China and giants of passenger planes like Boeing. China is the second-largest air travel market and many Chinese families can be expected to spend more money on flights each year. The aviation industry will take an increasing proportion of the Chinese and global economy. China's modernization won't be full-fledged if it does not have homegrown aircraft. The C919 plane shows that China has again started catching up with the world's aviation industry. Decades of reform and opening-up show that China can achieve whatever it wants with strenuous efforts. We can catch up with the world faster than expected. However, some pessimistic voices on the Internet doubt China's ability to catch up with aircraft manufacturing giants in the US and Europe and believe that passengers won't dare to fly on airliners like the C919. Aircraft safety should be taken more seriously than other vehicles. It's understandable that some people are skeptical of domestically produced planes. But the hyped skepticism shows the displeasing side of some Chinese. People all want a safe flight. When China unveils its first homegrown plane, even with some concerns for safety, Chinese people are supposed to laud the achievement first. We wish the C919 plane a smooth and successful trial flight and other tests and hope for progress in China's passenger plane development, which can tremendously boost the industry and technological advancement. China will be different when it can independently make large passenger planes, including long-range wide-body airliners. This outlook will be widely anticipated and welcomed. But for those naysayers, encouraging words and serious supervision may be more helpful. 4Commentary: China Lifts One-Child Policy to Two; What Now?